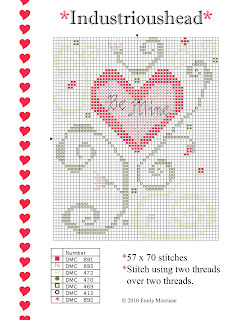 For Valentines I have a free chart for cross stitch or needlepoint! You may download it by first clicking on the image, then right clicking on the larger image and saving it to your computer. I would love to see any completed pieces of this pattern and how others interpret it and finish it. Emily, I happened to be looking thru an older TGOS and rediscovered your work. It's lovely and your incorporating of special stitches makes it all that much more wonderful.